In 2012 the Department of Transportation’s Inspector General sent investigators to interview Federal Aviation Administration (FAA) technical staff in Renton, where engineers working under manager Ali Bahrami were responsible for certifying new planes developed by Boeing. Now, two fatal crashes of Boeing’s 737 MAX have brought new scrutiny to the close-knit relations between the regulatory agency and the industry, to the FAA’s practice of delegating most safety analysis for new Boeing airliners to Boeing itself, and to shortfalls in the FAA’s final oversight role. With the MAX crisis jolting public faith in both Boeing and the FAA, Bahrami, now the executive at FAA headquarters in Washington D.C. specifically tasked with ensuring aviation safety, faces the daunting task of restoring confidence in his agency and in the process of certifying aircraft as safe. But Michael Collins, a just-retired aerospace safety engineer who worked under Bahrami here, sees him as representing what’s gone wrong at the FAA. Bahrami, 64, was born in Iran and came to the U.S for his education not long before Ayatollah Khomeini’s 1979 revolution. That year, having already earned a B.S. degree in engineering, he completed his M.S. at the University of Michigan and like many educated Iranian exiles decided not to return to his newly theocratic homeland. Instead, he took a job as an engineer with Douglas Aircraft in southern California, where he spent 10 years. Bahrami joined the FAA as an engineer in 1989, then rose to become in 2004 manager of the Transport Airplane Directorate in Renton, which oversees the safety of the operating fleet of U.S. commercial aircraft as well as the certification of new airplane models. During his tenure in Renton, Bahrami spearheaded efforts to delegate more inspection and certification work to industry, and specifically to outsource much of the safety analysis of new Boeing jets to Boeing itself. In 2013, Bahrami made a move reflecting the tightly intertwined relationship between regulator and industry. Just months after overheated batteries in flight caused the worldwide grounding of Boeing’s recently introduced 787 Dreamliner — a jet that Bahrami had shepherded through certification — he left the FAA for a lucrative lobbying job as a vice president of the Aerospace Industries Association,representing the big U.S. aerospace companies. Then in 2017, he returned to the FAA executive ranks at just one level below the top job: Based at FAA headquarters, he’s now associate administrator for aviation safety, overseeing 7,200 employees and a budget of $1.3 billion. 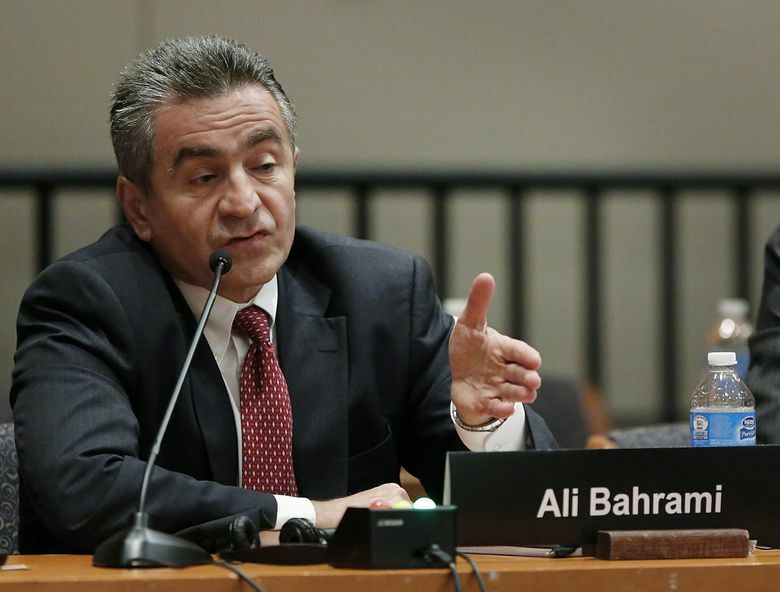 Bahrami, in emailed responses to questions, defended the delegation of safety analyses to Boeing and other private companies, and disputed Hall’s characterization. Today’s reality is that when Boeing designs a new airplane, almost all the hands-on safety evaluations and tests are done by employees of Boeing or Boeing’s suppliers who are authorized to represent the FAA. These Authorized Representatives (ARs) file written documents that are then evaluated for compliance and signed off by FAA technical specialists. A Seattle Times investigation published last month showed that the safety analysis of a new flight control system on the 737 MAX that played a major role in the fatal crashes of a Lion Air jet last October and an Ethiopian Airlines jet last month was done entirely by Boeing. 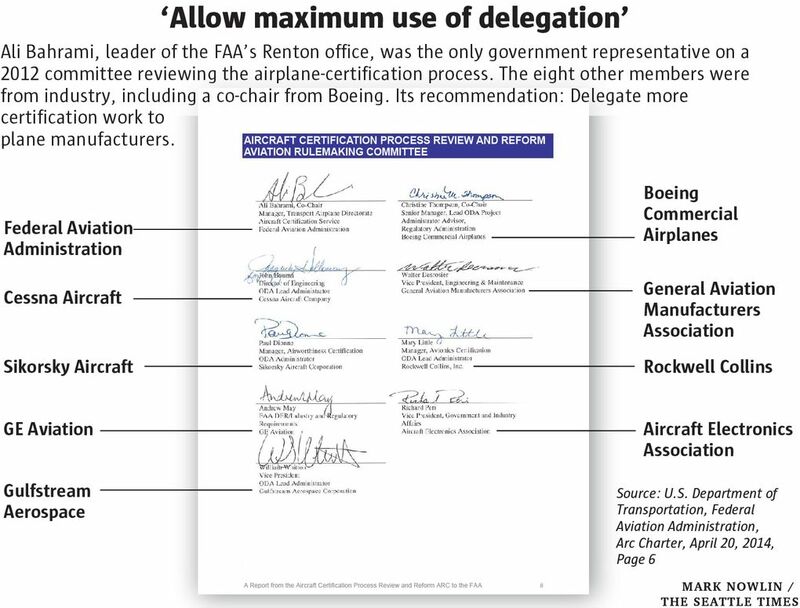 In addition, FAA engineers complained of being asked to delegate even more of the work to Boeing than originally agreed and of a constant schedule pressure during MAX certification. They said they were often given insufficient time to finish the evaluations — which in that case were sometimes signed off not by the technical staff but by managers or even just delegated back to Boeing for a final decision. In the case of the MAX’s suspect flight control system — called Maneuvering Characteristics Augmentation System, or MCAS — as a result of flight testing in the final year of certification, Boeing made significant changes to how it worked, including in certain circumstances increasing by a factor of four the system’s authority to move the horizontal tail so as to push down the nose of the plane. Those changes were never communicated back to the FAA technical staff, who had seen only a system safety analysis prepared before the changes. As the 2012 Inspector General (IG) investigation indicates, there was constant tension throughout Bahrami’s tenure as FAA boss in Renton between the agency’s technical staff, who wanted stringent application of the safety regulations, and managers who pressed for more speed and ever more delegation to Boeing. Mike McRae, a former senior aerospace engineer at the local FAA office, retired in 2013, a month before Bahrami left for his four-year stint working for industry. McRae said he retired unhappy with the direction of the safety agency and management’s lack of support for technical staff. He described Bahrami as a very capable bureaucrat who merely implemented the policy of increased delegation that was pushed from FAA headquarters. When Bahrami came in as boss, the policy was already firmly in place, mandated by Congress under heavy lobbying from Boeing and other giant aerospace companies. Bahrami himself argued, both from inside the FAA and when he spoke for industry, that there’s no alternative to delegation. The FAA has only about 1,300 personnel in its certification offices around the country, compared to the 56,000 engineers at Boeing. At a 2013 NTSB hearing after the 787 was grounded due to overheating lithium-ion batteries, Bahrami testified that he had only 20 to 25 staff working on the jet’s certification, so the FAA had to rely on 950 Boeing ARs to oversee and approve the detailed work. FAA personnel who certified the 787 never visited the battery manufacturer in Japan nor the company in France that designed the surrounding battery system. Boeing ARs handled all of that. And two IG audits have turned up shortcomings in the broader delegation process. An audit in 2011 found 45 instances between 2005 and 2008 where the agency had not carefully reviewed certification plans in advance, including one plan that didn’t comply with the regulations governing aircraft flight controls. A 2015 audit revealed that the previous year the agency had performed direct oversight of only 4 percent of the ARs conducting certification work on behalf of the FAA at aerospace suppliers. Bahrami co-chaired an extensive review of the airplane certification process in 2012. Tellingly, he was the only FAA representative on the review committee along with eight representatives of industry. The co-chair was Christine Thompson, a senior manager of Boeing’s airplane certification organization. A year later, now testifying for the industry, Bahrami told the House committee that due to lack of resources and budget the FAA simply cannot perform all the technical audits required to certify planes as safe. “Expecting FAA to keep pace with industry … is not in the realm of possibilities,” he said. He added that the shortage of engineers throughout the aviation industry means the public sector must compete with the private sector in attracting talent. “Given the complex nature of today’s aviation products, it is virtually impossible for regulators to have all necessary expertise in every FAA office throughout the country, especially when global manufacturing models continue to evolve and grow,” Bahrami wrote. Mo Yahyavi, a former top executive at Boeing who ran the 747-8 program while that big jet was being certified in 2010, said Bahrami came with his team and toured the Everett production line as the test planes were being built, to verify and validate Boeing’s work on the design and testing. “I really was impressed with the guy as a hands-on person and trustful,” said Yahyavi. Earlier in his career, Yahyavi was himself designated an FAA representative at Boeing specializing in propulsion systems, and was given extra training for that role in how to interpret and define how the jet’s software worked with its mechanical systems. Until the MAX crashes, regulation of aviation safety in the U.S., where 2.6 million passengers fly every day, has been the model for every other country. The last U.S.-regulated commercial passenger airplane lost in a crash was 10 years ago. In the decade since, airlines have flown 7.4 billion passengers safely to their destinations on 90 million U.S.-regulated flights with exactly one passenger death: on a Southwest Airlines 737 last year when an engine disintegration in flight blew out a window. That’s a remarkable record, not even closely approached by any other form of transportation. Former NTSB chair Hall believes the historically high level of air safety is based on years of experience and care, that’s now at risk from excessive delegation to industry. And he’s not impressed by Bahrami’s argument that the FAA doesn’t have the resources. “I have a hard time understanding anyone who sells increased industry participation by essentially saying that the agency he represents is incapable of doing its job,” said Hall. In the wake of the two MAX crashes, Congress has been scrambling to hold hearings and demand accountability. The House Committee on Transportation and Infrastructure has requested records from Boeing and the FAA as part of its investigation into the 737 MAX certification process. And yet Congress itself has backed that process, with prodding from the industry. The latest legislation, the FAA Reauthorization Act of 2018, passed into law just weeks before the Lion Air crash last October, requires the FAA to “delegate fully” unless the head of the agency determines there is specific public safety reason to limit the delegation. In such a case, the FAA is instructed to work with the industry partner to return it to full authority. Furthermore, if any certification glitch occurs to slow down an airplane program, the FAA must automatically elevate the issue to management and resolve it within a time period agreed with the manufacturer. Hall says the reason for such provisions is straightforward: The heavy lobbying of Congress by Boeing and other aerospace companies. U.S. Transportation Secretary Elaine Chao, the ultimate boss of the FAA, is the wife of Republican Senate Majority Leader Mitch McConnell. But the influence is bipartisan. In the late 1990s, the deputy FAA administrator and for a time acting administrator was Linda Hall Daschle, wife of U.S. Senator Tom Daschle, then Democratic Senate Minority Leader. Linda Daschle left the FAA to work as an aerospace lobbyist. Former FAA chief operating officer Krakowski defends the role of manufacturers in ensuring the safety of their own products. While there is always commercial pressure to meet schedules, he said, jet manufacturers face a more existential pressure to make their airplanes safe. Yet somehow, this complex safety ecosystem failed on the MAX.